The trail supporters feature is based on the Vancouver areas "Trail Adoption Program" which pairs a trail builder with a corporate sponsor to work on an adopted trail throughout a year. This feature can be used to list supporters of a trail or the builders & maintainers. This feature gives some credit and exposure to those who support the trails. A supporter can be linked to a Pinkbike Places listing, Pinkbike user profile or a special 'trail supporter' entity. A company logo can be added to these various links which will be displayed on the trails page and a special 'trail supporters' page for each region. 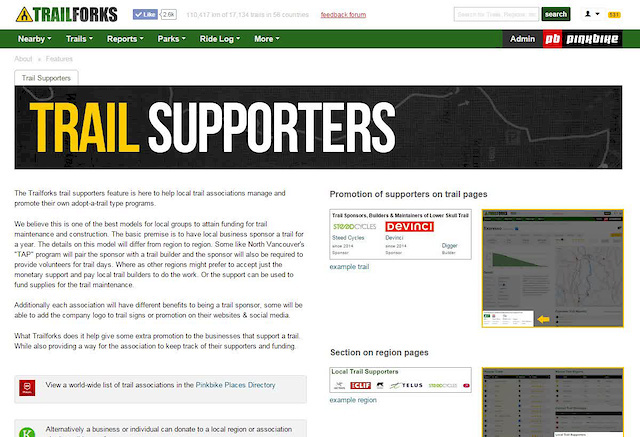 To add a trail supporter/maintainer edit a trail and look for the "Maintainers / Supporters" section near the bottom. You can add multiple supporters and specify which years they supported the trail.